Tamaris 22410, Women’s Closed-Toe Pumps, Black, 7 UK (40 EU) (8.5 US). 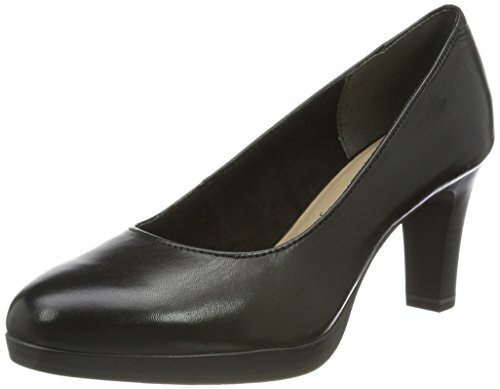 Classic, elegant yet versatile, the Zealot 1-22410-20 court shoes from Tamaris provide an attractive finish to any look. Providing comfort and style, these slip-on high heels are an absolute all-rounder and a must have. High quality leather upper with shiny finish. Breathable leather and moisture-wicking microfiber lining. Soft, memory foam padded footbed for cushioning. Touch It technology in the footbed to adjust to the contours of your foot. Durable and flexible synthetic sole.Anti-slide treading for stability.7.5 cm rounded heel for height boost.